The purpose of this study was to conduct a long term, retrospective analysis of patients treated with an endoscopic, paramedian approach for free fragments in the spinal canal at L5-S1, using a straight cannula of approximately 4 mm in outer diameter. In these cases, the entire system, including endoscope, grasper and cannula were passed into the spinal canal, through the interlaminar space to the pathology. This is done without any bone or joint removal. Also, the muscle and ligamentum flavum fibers are spread, not cut. 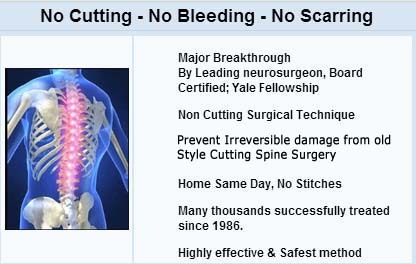 Significantly, the surgeon was able to remove the pathology, and also reconfigure the floor, without the typical retraction, dissection and bleeding that creates scarring inside the spinal canal. Only local anesthetic and IV sedation were used. 33 patients were available for follow-up, an average of 4.78 years after their procedures. 12 females and 21 males, average age 43.06 years, were evaluated. 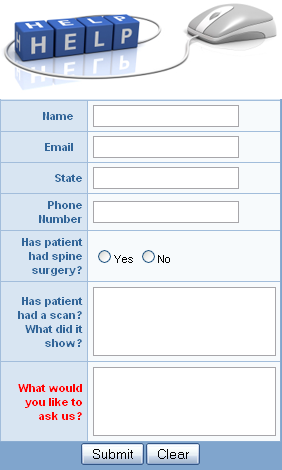 The Oswestry Low Back Pain Questionnaire was used prior to surgery and at the final follow-up. The mean preoperative ODI was 57.64% and finally, at last follow-up 2.73%. Therefore, these procedures were very successful on a longstanding basis. Also, there were no complications. No patient was at the ASC more than one hour after surgery. 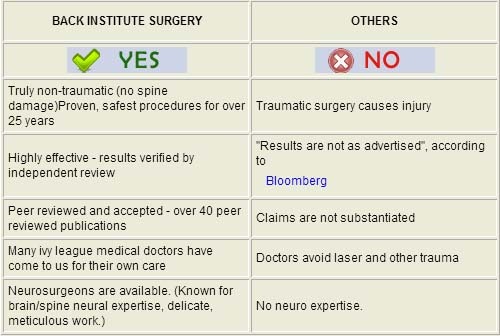 No patient had previous lumbar spine surgery, and none had surgery subsequently (no recurrences). 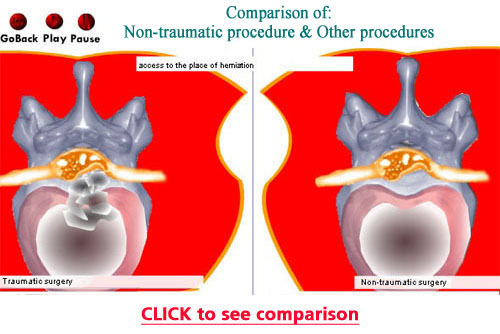 Patients with previous surgery, and therefore scarring in the approach path, were excluded. 1) Larger operations, than these, may create pathway cicatrix, and eliminate the possibility of a future endoscopic procedure. An endoscopic approach usually can not be done directly through scarring. 2) With the above approach, since no bone or joint is removed, and there is a lack of the usual spine surgery scarring, the negative sequelae associated with these aspects are not a concern. 3) If a lumbar MRI needs to be done in the future, no contrast should be needed, since the procedures described above typically do not produce scarring.